Welcome back to a much delayed Frightful Fridays (not actually on Friday)! I apologize for the huge delay in posting, but now that I'm finally getting over con crud, I hope to be back on a much more regular basis. Today's monster, the huckster devil, could provide a long-term foil for your characters, as it leads them from one beleaguered community to another, selling its nostrums and propping up petty dictators. I hope the wait was worth it for this week's entry, and I'll be back next week with another monster. Thanks for your patience, and thanks for reading! You can find this delightful fellow here. 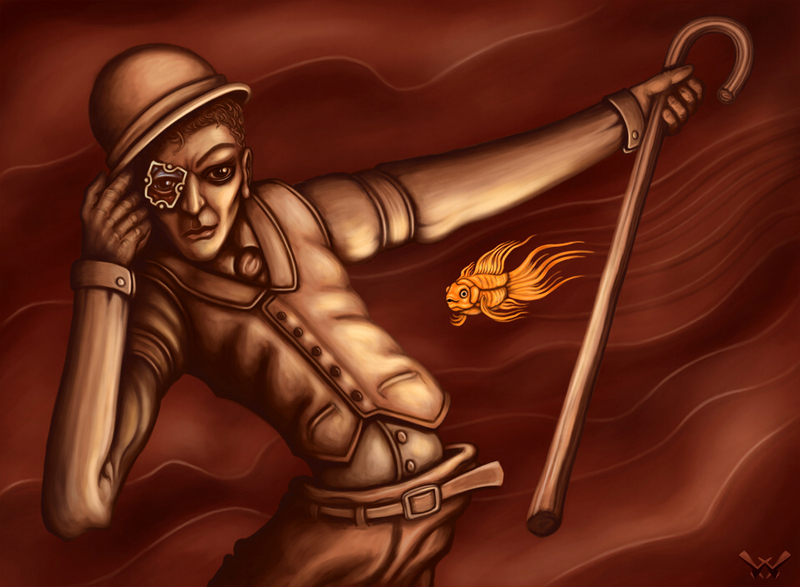 This sallow, willowy devil carries a cane and a suitcase full of odd concoctions; it flashes an incongruously warm and friendly smile. Languages Abyssal, Celestial, Common, Draconic, Dwarven, Elven, Giant, Infernal, Sylvan, Undercommon; telepathy 100 ft. Poison (Ex) Sting—injury; save Fort DC 24; frequency 1/round for 6 rounds; effect 1d6 Wis damage; cure 2 consecutive saves. The save DC is Constitution-based. Proxied Enchantment (Su) A huckster devil may designate another creature as the effective caster of any of its enchantment spell-like abilities. The designated creature must be on the same plane as the ability's target when the devil uses the ability; otherwise, the ability fails. The huckster devil sets the save DC and caster level for the effect. Found on all layers of Hell, a huckster devil attempts to sell its dubious services and wares to other devils, whose reactions to the huckster devil's routine range from amusement to disdain. The devil has a much easier time hawking its merchandise on the Material Plane, where no end of credulous people fall for its schemes. This thin devil stands 6 feet tall and weighs 150 pounds, but it can change its outward appearance to fit the expectations of its marks (especially to conceal its tail). A huckster devil arrives in a beleaguered community in the guise of a passing traveler and chats with residents about troubles affecting the community. 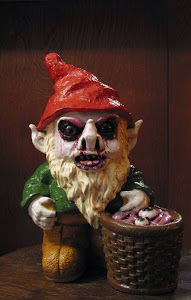 The devil spends a day or two discovering the most important issues to the residents (with the help of judicious applications of charm monster to loosen tongues), and then the "friendly visitor" moves on. A week or so later, the devil returns in a different guise purporting to possess the solution to the community's woes. During the intervening time, the huckster devil applies its considerable skill at crafting alchemical goods to make items that bring rain to a drought-stricken community, restore health to withered crops, or cure a disease afflicting the community. All it requires in turn is that a single resident sign a contract as a formality. Once the devil has brokered a deal, it leaves, and, several weeks later, the original problem returns, only considerably worse. Occasionally, an unpopular noble or warlord acquires a huckster devil's services to improve his or her image. The devil spends months as an "advisor" to the dignitary, who travels around his or her holdings in a goodwill tour. During this tour, the devil charms and dominates crucial subjects, turning control over those subjects to its employer. A huckster devil sometimes requires the beneficiary of its services to sign a contract, but it will waive this requirement if it serves to enhance a particularly despotic regime. GenCon prep followed by actual GenCon and then followed by the GenCon flavor of con crud (plus my daughter getting her wisdom teeth extracted) made the past couple of weeks monster free, for which I apologize. I'll return next week with a new monster (or two or three). Thanks for your patience! Welcome back for a new Frightful Fridays! Drejk (who was somewhat responsible for the zloty) brought this caterpillar to my attention, and I could not tear myself away from the horns at the back of the bug's head. 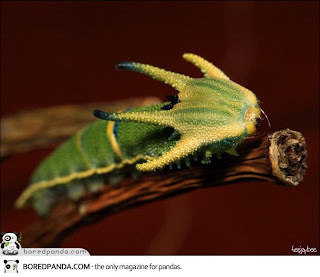 I thought it would be cool for the bug to have a ring on one of the horns, or maybe a necklace dangling off a pair of the horns. How would it get those items, though? By stealing them, I thought, and the filch bug was born. As I've discovered in some of the games I've run, character death is not nearly as terrifying to players as losing crucial magic items. The filch bug plays on those fears. I hope you like this critter, and I'll be back next week with a new one. Thanks for reading! This green, flying insect is as large as a typical dog. Its bizarre head sweeps back into four horns, one of which bears a ring, while the others vibrate as if searching for something. Command Word Emulation (Ex) While a filch bug cannot speak, it can modulate its droning to sound like a command word for a magic item. It gains a +12 bonus to its Use Magic Device checks to activate an item blindly. A filch bug has evolved a strange way to protect itself, by stealing magic items from other creatures and using those items for defense and occasional offense. A party usually encounters a filch bug already equipped with one or two magic items (as the stats above demonstrate). The creature usually leaves others alone, since it is a relatively weak fighter, but, if it senses magic it desires or must act in self-defense, it brings all of its natural and acquired abilities to bear. A filch bug measures 3 feet in length and weighs 50 pounds. When a filch bug chances upon creatures, it lies still either in tall grass or in tall branches where it can focus its detect magic ability on potential victims. If it discovers a small item radiating abjuration or evocation magic, which it sees as mauve and cobalt blue respectively, it uses pilfering hand to steal the item from its owner. If successful, a filch bug flies away with its new prize. Otherwise, the creature attacks its target with its weak, yet paralytic, bite, after which it can rummage through the victim's belongings to find the item it prizes. If it takes an item, it finds a secluded location and places the item on one of its horns, which can accept two rings and a chest slot item. A filch bug is not very bright, and spellcasters who are aware of the creature use magic aura to trick it into stealing worthless junk, after which it will depart. Other creatures raise filch bugs and take advantage of the creatures' thieving natures and their paralytic bites. Sometimes, a filch bug attack is a prelude to a larger attack, where the filch bug's role was to merely soften up its target. Filch bugs lay 3-6 eggs a year, and each egg is worth 500 gp on the black market. A fully grown filch bug—filch bugs reach maturity after six months and only live for five years—is untrainable. It's Saturday, so it must be time for another Frightful Fridays! entry. Today's monster is a new kaida, this one suited for monks (and ninjas to a lesser extent). I've been slowly amassing kaidas suitable for all the Pathfinder RPG core classes, and this dragon, which my friend Patrick brought to my attention, seemed like a great fit for the monk. A spellcasting monk needs a considerable amount of multiclassing to obtain a contemplative kaida as a familiar, but the benefits should offset that cost. I hope you like today's monster, and I'll be back on Friday with a new one. Thanks for reading! 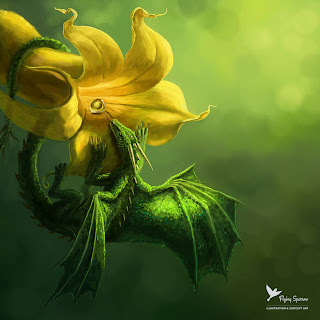 This little emerald dragon sits on a flower's lip and regards a dewdrop within the flower with great interest. Speed 20 ft., fly 50 ft. (perfect), swim 30 ft.
Contemplated Action (Ex) Once per day per Hit Die, as a full round action, contemplative kaida enters into a meditative state that gives it the benefit of sanctuary for the round. On its next turn it adds +20 to a chosen ability check, skill check, or attack roll. Insightful Strike (Ex) A contemplative kaida uses its Wisdom modifier on damage with its natural attacks instead of its Strength modifier. This ability does not work on creatures immune to precision damage. Knowledge through Enlightenment (Ex) A contemplative kaida can use its insight to derive an answer to a question, allowing it to make a Knowledge check untrained and adding its Intelligence and Wisdom modifiers to the check. The kaida usually applies its contemplated action ability to a Knowledge check. A contemplative kaida is a delicate creature that prefers to spend its time reflecting upon the mysteries of the universe. The kaida also likes to share its wisdom with those who will listen to it, but it knows not to come across as a braggart about its knowledge. The dragon will flee from a fight if it can, but it proves to be a dangerous opponent when it must defend itself. The kaida requires a minimum of sustenance to survive, and seems to derive most of its nutrition from experiencing its surroundings. A contemplative kaida is 18 inches long, including a 6-inch long tail, and weighs 20 pounds. Unlike many other kaida, a contemplative kaida does not bond with an item. The dragon considers itself in tune with the universe, and thus bonded with everything contained within. A contemplative kaida still chooses companions with whom it travels in order to gain alternative insights into the world. A spellcaster can choose a contemplative kaida as a familiar. The spellcaster must be at least caster level 3rd, character level 7th, have the Improved Familiar feat, and have a ki pool. A contemplative kaida adds its Wisdom modifier to the spellcaster's ki pool, and, once per day, it can grant the spellcaster the benefit of its contemplated action ability. Hello, and welcome back to Frightful Fridays! I apologize for the hiatus, but I got caught up in deadlines and illness. Today's first entry, the fiery ant queen, rectifies an oversight on my part from the previous entry. The intelligent fiery ant queen can marshal its fiery ant forces into a frightening army that uses more sophisticated tactics than overwhelming and burning everything in sight. I hope you like the fiery ant queen, and I'll be back later today with another entry. Thanks for reading! This bloated, red creature has a nimbus of fire. Periodically, a large, bright, red ant emerges from the creature's rear. Burning Breath Weapon (Ex) If a victim of a fiery ant queen's breath weapon fails its Reflex save, it catches fire and takes burn damage. Fiery Ant Command (Su) A fiery ant queen can directly command its colony out to the extent of its telepathy range. This grants all fiery ants within range the benefit of the Lookout feat, and allows the ants to use basic tactics in combat. A fiery ant given a directive by the fiery ant queen will follow that directive even when it exits the range of the queen's telepathy. Fiery Ant Poison (Ex) Bite—injury; save Fort DC 17; frequency 1/round for 6 rounds; effect 1d4 Con; cure 2 consecutive saves. The save DC is Constitution-based. Spawn Fiery Ant (Ex) A fiery ant queen spawns 3 to 6 fiery ants per day. In combat, it can expedite the process, spawning a fiery ant every 1d4 rounds. A fiery ant queen is a living portal to the Elemental Plane of Fire and fuses the essence of that plane to fleshy material to create a colony of fiery ants. The queen spawns fiery ants for protection and as a means to procure food it otherwise cannot gather for itself. A fiery ant queen is 4 feet long and weighs 180 pounds. A fiery ant queen spawns several fiery ants per day, depending on the availability of food, with 1 out of 10,000 new fiery ants becoming a new queen. The new fiery ant queen leaves with a pair of fiery ants to form a new colony, while the original fiery ant queen remains with its colony for roughly a year when the colony devastates the immediate area. 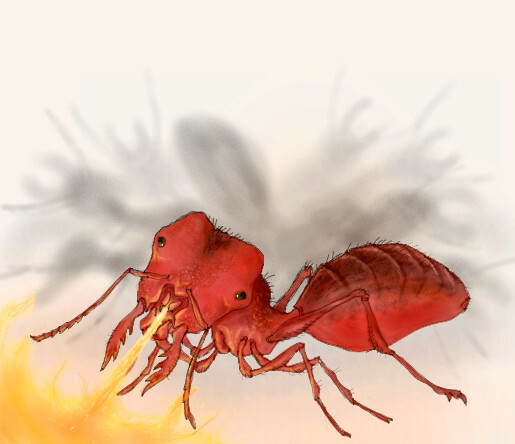 Once the colony depletes the food supply, the fiery ant queen takes its most powerful fiery ants to another location to start a new colony, leaving the old colony to self-destruct.